People sometimes say that Schiphol is like a city. That’s because it’s filled with places like shops, a medical centre, doctors’ offices, restaurants and more. There are also two museums located at the airport, and a meditation centre with three pastors. Let’s take a take a look at all the special activities you can enjoy next time you visit our airport. Most airports don’t have a library within the airport – but we do! You can grab a book from the library, then read it while seated on one of the comfortable chairs. There are books by five hundred Dutch authors, which have been translated into 40 world languages. There are also other media available – you can watch cartoons on the iPads or touchscreens, or search for a song in the largest digital music collection in the Netherlands. If you are lucky, another traveller might play something on the piano, or you could play something yourself if you want to demonstrate your skills to fellow travellers. Where to find it: after security, Holland Boulevard, between Lounge 2 and 3. Schiphol may never be a truly quiet place, what with so many travellers using it every day. However, there is one place at the airport that really is quiet – and that’s the Meditation Centre. It’s a place where you can pray, meditate or just enjoy contemplative silence. Everyone is welcome here, whether you are Muslim, Christian, Jewish or non-religious. There are even three chaplains working here, similar to those that work at church, who are there if you want support or just want to talk. There is a church service every Sunday at 11am. The service is held in English so that every traveller can understand it. Feel free to drop by and walk in and out as you please, because you have to get your plane! Where to find: after Security, second floor Lounge 2, next to the Frames Café. If you have time left before you have to board the plane, you might want to shop – or you could visit a museum! If you’re familiar with Amsterdam’s NEMO and Rijksmuseum, there are small, satellite versions at Schiphol. NEMO Science Museum is a place where children can learn about technology and science by doing experiments – for instance, making sound waves visible or seeing how a plane uses air to rise. You can also see masterworks the Rijksmuseum, which has 17th century Dutch paintings from portraits to famous Dutch landscapes, in regularly-changing exhibitions. Where to find it: after security, Holland Boulevard, between Lounges 2 and 3. Aircraft comes in all shapes and sizes. At Schiphol, you can see a lot of planes take-off and land every single day. That makes planespotting a fun activity at our airport. 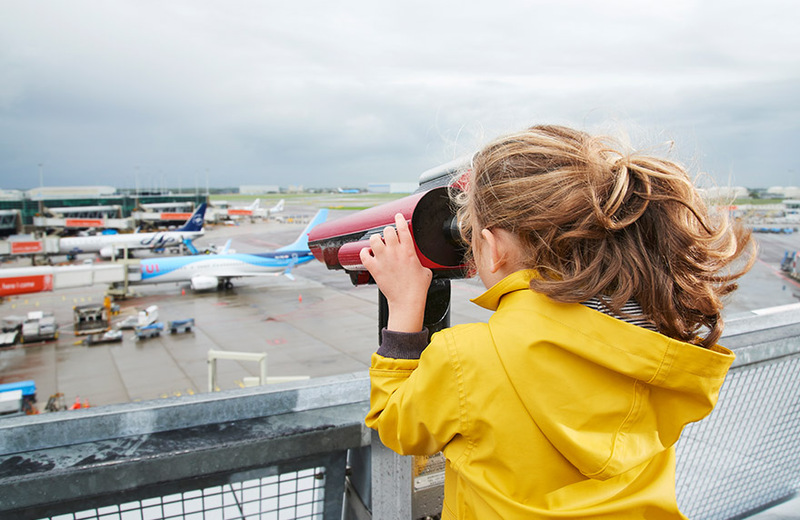 To see the planes, you don’t even have to be flying, but just visit Schiphol for a day to watch them. For example, you can visit our free Panorama Terrace, where you’ll have perfect views of the platforms and planes. You could even jump aboard the KLM Fokker 100 on display here, then get behind the wheel and feel like pilot. (The Panorama Terrace is closed right now for renovations and will reopen during the summer of 2019.) If you prefer to see the aircraft closer to our runways, you can visit our spotter spots along the Buitenveldert or Polderbaan runways. Don’t forget to bring your camera so you can film or take photos of the planes! Panorama terrace - third floor in the terminal. Take the stairs (or the lift) between Departures 1 and 2, then follow the 'Panorama Terrace' signs. Spottersplek Buitenveldertbaan – Schiphol-Oost, postcode 1118 EL. Accessible from the N231/Schipholdijk. Spotters spot on Polderbaan - at the end of IJweg on the west side of the Polderbaan, postcode 2141 CN. If you would like to see other special places at Schiphol, check our YouTube channel where we regularly post videos – for instance, watch a suitcase travel through our system or take a journey with the Aviation Police. From Schiphol you can fly all over the world, from America to Africa and from Australia to Asia. How many countries have you been to? The Control Tower has some of the best views over Schiphol. The workers here ensure that all planes can take-off and land safely. 65,000 people keep Schiphol running smoothly, from bird scarers to firefighters to professional plane parkers. Explore some of our special professions!